Do you dream of flying for the United States Military but don’t have a clue about how or where to begin? Are you frustrated because you can't find the information that you need to prepare for your Fighter Pilot career? Are you trying to decide if the lifestyle of a fighter pilot is for you? Your only resource on flying Mach 1 is your local recruiter, and with all due respect, they have never been through the process of becoming a fighter pilot themselves so their knowledge is limited to brochures and a few guidelines they have. Just listen to what Dan said while he was standing infront of an F-18. Besides that, there are actually 3 crucial things that the recruiter is looking for before he even recommends you to be commissioned as a fighter pilot. If you contact a recruiter before you learn these 3 things you could blow your chances of even being commissioned as a pilot candidate! And once you are accepted into the pilot program you still have to earn your pilot position. Every colonel, lieutenant, chief, cook and bottle washer will be asking him or herself if they would get into an aircraft with you and trust you with their life. You'll need to learn tips and tricks that'll propel you to the front of your classmates during flight training so you can choose the aircraft YOU want to fly. And believe me, any aircraft that starts with "F" is usually taken by the first in line! How do I know all of this? Because I’ve actually "been there and done that." Please Note: Your email address is kept in the strictest confidentiality! Hi... My call sign is Head Rush and I, like you, had dreams of becoming a fighter pilot but was oblivious about how to go about it. When I finally figured out where to begin I still had no idea about what it actually took to ensure that I flew the jet of my choice. Not to mention if the lifestyle of a fighter pilot was even for me. I consider myself blessed. I've served as the Marine Corps leading expert in fighter maneuvering and in F-18 tactics. I've flown multiple combat missions over Iraq and have fought Russian MiG-29 and MiG-21 aircrafts. Recently, I served as a key player in the development of airborne tactics for the F-35 Joint Strike Fighter - the next generation fighter aircraft. You see, I've watched a lot of guys fall flat on their face during Officer Training School and even more get pushed to the end of the line in flight school. Some of these guys became close friends and it broke my heart to see them get washed out because of simple mistakes that could've been prevented had they been prepared. It frustrated me because if these guys knew just a few crucial tips it would have greatly increased their chances of actually making it. I Could Ensure, With Almost Complete Certainty, That They'd Be Guaranteed A Pilot Standardsot, Excel In Flight School, And Awarded The Aircraft Of Their Choice. The next day my work began and becomefighterpilot.com™ was being created. I turned on my computer and began dumping everything I had stored in my brain onto the screen. Mistakes I'd made and mistakes I’d seen my fellow recruits make. I researched and wrote until I was blue in the face. I talked with recruiters, instructors, my fellow officers and pilots. What they were looking for, what they expected, what they wanted to hear, and the most important things that a new recruit needs to do to fly fighter jets. Become A Fighter Pilot In The U.S. Military. And to be honest, I didn’t really know what I was going to do with this information, but I knew it was absolutely invaluable to those select few individuals like you who have dreams of flying for the Air Force, Marines and Navy. Whether you're deciding if becoming a fighter pilot is your destiny, or you've already begun the process and want to blow away your competition, the Fighter Pilot Power Pack™ will provide you with every last detail you need to not only to get the jet of your choice, but become one of the most elite fighter pilots in the country. Listen as Cassidy talks about what Head and his Fighter Pilot Power Pack™ means to him. Now let me clarify something. This pack isn't a bunch of thrown together information that you need to swarm through and try to figure out what applies to you. It’s a systematic program that'll literally hold your hand through the entire process of becoming the next "TOPGUN" Fighter Pilot, from the day you even consider if this is something you want to do, to the day you make your first solo catapult launch off of an Aircraft Carrier or runway. No complicated government documents, no confusing military jargon, just a straight forward real-world, apply-it-today program that anyone can follow. ...This Information Doesn't Exist Anywhere Else. This Is Select, Insider Information Directly From The Source. From the same people who will be scrutinizing you, training you, analyzing you, and selecting you. You’ll have insider information that will catapult you to the top of your class. 3 simple steps to prepare for and finish first in Officer Candidate School or Boot Camp. Nothing worries military pilots more than the possibility of failing the flight physical. Reduce your anxiety by learning exactly what to expect on every flight physical. 3 things you definitely DO NOT want to do when contacting a recruiter. Doing just one of these things could eliminate your chances of getting a pilot slot. How to choose the right service for YOU, (Air Force, Navy, Marines) before they choose you. Impress your superior officers by learning to act like a fighter pilot. How to determine whether the Service Academy, ROTC, Officer Candidate School, or Enlisted Commissioning is the best entry program for your wants and desires. Make an impact on your recruiter with this step-by-step method you must use when contacting him or her for a pilot slot. How to be guaranteed a pilot slot before signing your life away for the next 10 years. A glimpse into your future by learning where you'll perform your flight training, the fighter jets you'll be flying, and how to ace every step of your training. 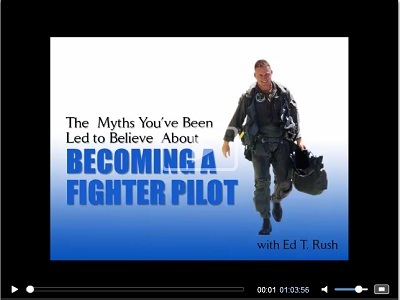 The most common misconception about the physical qualifications of a fighter pilot. Save time, energy, and be sure that you are making the right choice with detailed data on each service's commissioning programs. 9 tips that will make ground school easier. 6 flight simulator tips you must know to pass your flight checks. Two distinguishes used to decide if you'll fly jets, helicopters, or cargo airplanes and how to use them to get the aircraft YOU want. What to do if you fail your flight physical (and still pass on to fly jets). Learn how to keep physically fit with the exact guidelines and requirements for nearly every medical condition. Now these benefits alone can virtually assure that you achieve the fighter pilot position of your dreams. the U.S. Government or the United States Marine Corps.